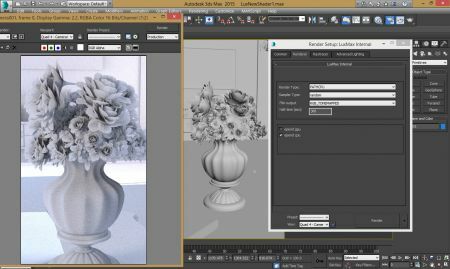 MaxLuxCore is the 3dsMax internal plugin to render directly inside 3dsmax using LuxCore API. The plugin(s) is written in c++. MaxLuxCore is still under development and needs more work to be a complete renderer, in short time it will support all standard lights, shaders, cameras and more. This renderer plugin is still in an early stage of development. For now, you can report any bugs and suggestions in MaxLuxCore Subforum until bug tracker gets ready. Material previews in the material editor. This is a template material that we use for development, this is where we first implement new features and then move them over to other shaders. More features are added as we progress. When an unsupported material type is chosen MaxLuxCore will render it as a standard grey material. All unsupported shaders are simply rendered as a matte grey material. Not all parameters for these are translated yet, but color and intensity is supported. The rest is work in progress - and later we will create fully custom lights that have all the luxrender light parameters in their GUI. if there is no light in the scene, the plugin will automatically create a skylight as a Default light in the scene. It'll work as ambient/global light. We support the standard 'target camera' and 'physical target camera. We will add support for 'viewport' type rendering soon. Also, a custom Luxrender camera with all the luxrender camera settings in its GUI will be created as soon as we have time. This page was last edited on 30 March 2019, at 21:29.